Ex-Liberal Democrat chief Lord Ashdown has called for new measures to tackle human trafficking networks operating across the Mediterranean, warning current policies give rise to “drowning refugees” while traffickers remain unfazed. Ashdown, who served as a Royal Marine before entering politics, said the British government must play its part in targeting traffickers in North Africa. The former Lib Dem leader condemned the current policy for dealing with the issue and called upon the government to do more. “It is unsustainable and unacceptable to have a policy of drowning refugees when we should be attacking the smugglers,” he said. Ashdown’s comments follow the tragic drowning of hundreds of migrants off the coast of Libya, after a boat they were traveling in capsized on Sunday. The vessel, which ran into difficulty in Libyan waters south of Lampedusa, was carrying an estimated 950 people. Many migrants ferried across the Mediterranean are thought to be from war-torn Syria and sub-Saharan regions of Africa. As many as 1 million Syrian and sub-Saharan migrants are currently waiting in Libya to cross Mediterranean waters into Europe, according to Italian officials. Under the coalition government, Britain has espoused a particularly hardline stance on the deaths of migrants in the Mediterranean. In October 2014, Home Secretary Theresa May argued at an EU summit that search and rescue missions in Mediterranean waters should be abandoned. Previously, Britain and other leading EU states conducted such search and rescue missions across these waters. However, since the policy was scrapped, at least 1,500 people are thought to have drowned in the Mediterranean Sea. Despite the government’s hard-line stance on the issue, Prime Minister David Cameron indicated a policy shift may be on the horizon. Speaking on Monday, Cameron vowed that Britain “can do more” to clamp down on the Mediterranean’s human trafficking crisis. The PM said he would take a break from election campaigning in order to attend an emergency EU leaders’ meeting in Brussels on Thursday. Cameron hopes the summit will give rise to an EU-wide agreement on tackling the criminal syndicates responsible for the deaths of hundreds of migrants ferried across Mediterranean waters. Central to this plan is the need to “deal with the problems in the countries from which these people are coming,” he said. 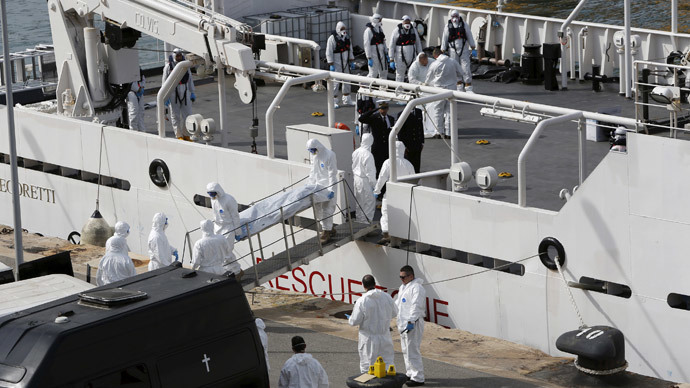 Preliminary talks regarding the Mediterranean disaster were held at an emergency meeting in Luxembourg on Monday. Interior and foreign EU ministers who were present agreed to conduct military operations against human trafficking networks operating in Libya, which are commonly responsible for the death or drowning of vulnerable migrants. Additionally, the EU leaders demanded increased cooperation with Libya’s neighboring states such as Tunisia, Egypt and Niger as a means of clamping down on routes commonly used by traffickers. The ministers resolved to step up patrols in the Mediterranean, and are expected to convene again on Thursday to settle upon a final agreement. Retired Royal Navy chief Lester May said the proposals discussed in Brussels on Monday pose important questions from an international law perspective. “If you have a boat full of people, you can’t simply stop them in international waters,” he told the Guardian. Reflecting on the Mediterranean catastrophe, Labour leader Ed Miliband expressed shock and disgust. “We cannot stand by as people drown in European waters simply to escape conflict in Libya and Syria,” he said. Miliband went on to pledge a Labour government would take decisive action alongside EU leaders to deal with the refugee crisis. “Our country is known throughout the world for our generosity of spirit. It’s time to reflect that and take action in the face of this terrible tragedy,” he added. Tim Farron, foreign affairs spokesman for the Liberal Democrats, said the party plans to push for an immediate review of the EU bloc’s anti-trafficking measures and reassess the recently scrapped search and rescue policy. On Tuesday, the captain of the boat that capsized in Libyan waters was charged with the reckless homicide of hundreds of migrants. The captain, who hails from Tunisia, was also charged with advancing illegal immigration alongside one of his Syrian crew members. The two men were among 27 survivors who landed in Sicily on Monday night. Some 800 migrants in total are estimated to have perished in the human trafficking disaster. Among the boats’ passengers were nationals from Syria, Eritrea, Somalia, Mali, Sierra Leone and Senegal.